… or is it possible to boost the baby’s immune system before it is born or immediately afterwards? It might seem that upon birth the baby’s digestive system is sterile. However, this is not exactly so. Research provides evidence that it is already in the mother’s womb that a baby is exposed to contact with intestinal bacteria. Hence a well-balanced diet and healthy lifestyle are important considerations for pregnant women. This means that it is already during pregnancy that a mother to be can positively affect the immunity of her baby, by taking care of proper supply of omega acids – especially DHA, vitamin D and iron in her diet. Many mums are surprised at the fact that the manner in which they give birth affects the immunity system of their babies. However, it is not without meaning whether we choose a natural birth or a Caesarean section. In one of the studies conducted, a higher level of bacteria causing intestinal inflammation and diarrhoea was observed in babies born by Caesarean section. In the same study, the babies born by natural labour exhibited low levels of harmful bacteria and high levels of Bifidobacterium which have a positive effect on the body. Quick contact with its mother’s skin immediately after birth provides the baby with more of the so-called “good bacteria”, which protect the baby against infections. Babies who do not experience such contact become carriers of bacteria from other persons present in the delivery room. So do not be afraid of early skin-to-skin contact after delivery, because this is a unique moment for you and your baby. 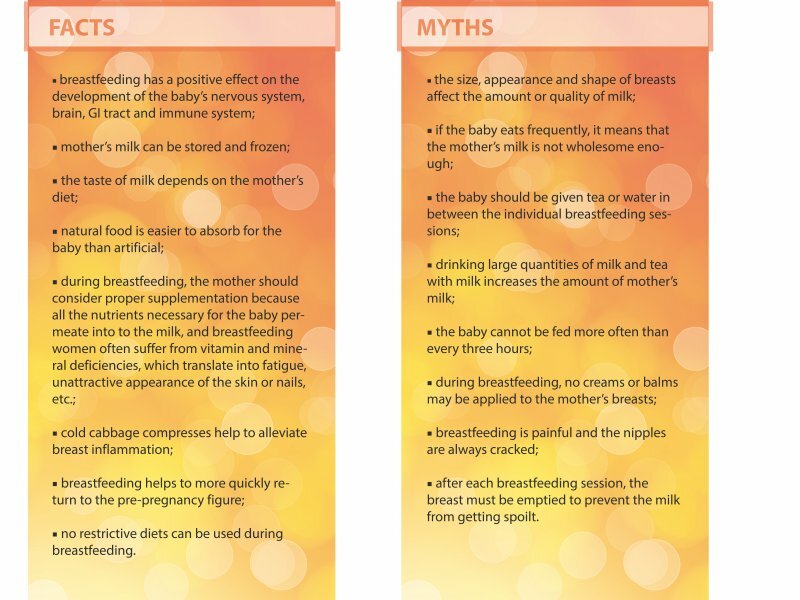 In the first days and months of the newborn baby’s life, a crucial role is played by breastfeeding. Mother’s milk is easily digestible and delicate for the baby’s tummy. The so-called colostrum, or first milk, builds a kind of protective coating for the baby’s intestines, thereby limiting microbial penetration into the baby’s body. … or what is important for brain development in the foetal period and infancy. Do you know that during pregnancy and breastfeeding you can positively affect the development of your baby’s brain? How can this be achieved? In a very simple way! By starting supplementation of folic acid, DHA, iron, B vitamins and choline at this special moment for you. Fatty acids, including DHA, were discovered in mother’s milk in 1982. Docosahexaenoic acid (DHA) is the main component of the cerebral cortex and makes up as much as 60% of all the polyunsaturated fatty acids in the brain. It accumulates in the baby’s brain between the 26th and 40th week of pregnancy, when this organ undergoes intensive growth. After birth, the baby’s brain develops very intensively, growing rapidly to just over ½ the size of an adult’s. In this period, which is extremely important for the baby, adequate levels of DHA in mother’s milk are essential for the development of its cognitive functions and the brain. Products rich in DHA: fish, linseed, linseed oil, soy products. – 400–600 mg from the first month of pregnancy1. – 600 mg during breastfeeding2. To ensure an adequate level of folates, doctors and midwives recommend starting folic acid supplementation as early as three months before conception, as well as throughout pregnancy and lactation. Proper intake of folates is essential for proper growth and development of nerve cells and the brain. Still, however, in almost every second Polish woman (according to A. Seremak-Mrozikiewicz), the enzyme that converts folic acid into its active form does not work properly. In such a situation, there is a certain risk that the concentration of folates in the body will be too low, thereby reducing the baby’s protection against neural tube defects and anomalies in the foetus. It is therefore worth considering supplementation with products, which contain not only folic acid but also its active form – the so-called active folate (in chemical terms: calcium L-methylfolate). Products rich in folic acid: soybean, spinach, Brussels sprouts, broccoli, asparagus. – 400 µg of folic acid and 400 µg of active folate3. During pregnancy, tissues have a higher demand for oxygen. The baby’s tissues grow very fast and consume more oxygen than the maternal tissues. Iron is also responsible for bringing oxygen to the command centre of the baby’s body, i.e. the brain. It is iron that contributes to proper formation of neurotransmitters and the sheath of nerve cells (the so-called myelin), necessary for proper transmission of nerve impulses. On that basis, scientists claim that iron deficiency in pregnancy may lead to the disturbance of the baby’s cognitive processes, including concentration and memory4. Iron absorption from meat amounts to 20% and from plant products – only 5%. Products rich in iron: mussels, octopus, buckwheat and millet, nuts, beets. Important! Iron-rich liver is not recommended for pregnant women due to its high cholesterol content and excessive amounts of vitamin A.
Choline and vitamins B (especially B6 and B12) contribute to the formation of the genetic material as well as the development of the baby’s brain and nervous system. Moreover, numerous studies revealed correlations between choline intake during pregnancy and better results achieved in the tests assessing memory, concentration and spatial orientation in the children. Other studies suggest that vitamin B12 deficiencies during lactation may contribute to problems with proper cognitive and psychomotor development of the baby5. It is therefore worth taking care to proper diet and supplementation to provide the baby with optimal conditions for growth. Particular attention to the supply of vitamin B12 should be paid by women on vegetarian and vegan diets, because meat is the main source of this vitamin. – choline: egg, cauliflower, iceberg lettuce, peanuts, meat. – B12: meat, cheese, fish, egg. – B6: meat, bananas, potatoes, avocado, fish, pistachios, spinach. Supplementation: choline 125 mg, B12 4 µg, B6 2.6 mg. Recommendations of the Polish Gynaecological Society, Ginekol. Pol. 2014, 85, 395–399. Position statement by the Expert Group concerning the dietary recommendations for pregnant women during lactation, Standardy Medyczne/Pediatria 2013, T:10, 265–279. Seremak-Mrozikiewicz, Significance of genetic polymorphism investigations in pregnancy complications. Arch Perinatal Med 2013; 19: 7–11. De Deungia at. al. Pediatr. Res, 2000; 48: 169 – 176. Drews, Aktywne wspomaganie szlaku folianów – epigenetyczny wpływ choliny i witaminy B12 na rozwój ciąży [Active support of the folate pathway – the epigenetic influence of choline and vitamin B12 on pregnancy development]. Ginekol. Pol. 2015, 86: 940–946. http://compositamama.eu/wp-content/uploads/2017/03/Mózg-dziecka.jpg 562 1000 composita http://compositamama.eu/wp-content/uploads/2017/02/logo.jpg composita2017-03-01 12:33:122018-11-21 16:47:19Your baby’s brain "in the belly and on a nappy-changing table"